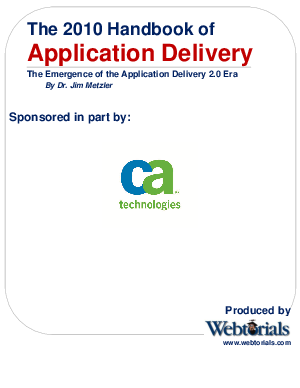 As we enter the Application Delivery 2.0 era, leading edge IT organizations must develop plans for implementing an application delivery function that can respond to both the existing and the emerging challenges. The development and implementation of those plans will not be easy, in part because the plans must cross myriad organizational boundaries and involve rapidly changing technologies never before developed by vendors, nor planned, designed, implemented and managed by IT organizations in a holistic fashion. The primary goal of this handbook is to help IT organizations plan for that transformation.